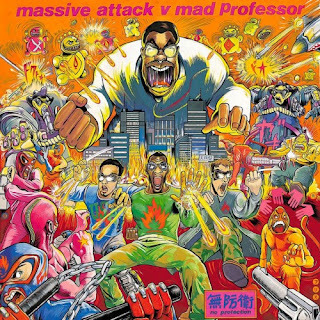 Massive Attack v. Mad Professor No Protection (heavyweight vinyl LP, Virgin Records, 2016 reissue; originally released in 1995 on Wild Bunch Records): I don't quite remember how I was first turned onto the extraordinary dub master Mad Professor. Perhaps it was a review in Tower Records' "Pulse" magazine or the 1995 issue #2 of the Beastie Boys' "Grand Royale" magazine that included a 24-page feature on Lee "Scratch" Perry with an extensive evaluation of his discography, which covered several incredible collaborations between Perry and the Professor. However it transpired, I quickly acquired most of the Mad Professor/Lee Perry albums, including Black Ark Experryments and Mystic Warrior, as well as many of Mad Professor's dub albums, most notably the magnificent Anti-Racist Dub Broadcast (which featured Rico Rodriguez on t-bone!). So back in '95, when I stopped by (the now long gone) Jammyland one day and saw this new CD from Mad Professor and Massive Attack (who I really didn't know much about other that they had collaborated with Horace Andy), I was really curious about it and asked whomever was behind the counter. They highly recommended it (might have even played a track or two for me) and I bought it on the spot. The story, I later learned, was that trip-hoppers Massive Attack had asked Mad Professor to remix a track off their somewhat underwhelming second album Protection--and they were so pleased with the results that they arranged for him to create dub mix of the entire album, which completely transformed the source material and became an unqualified hit. When I first listened to No Protection, I didn't have the original songs to compare the dubs to--but it didn't matter. These tracks stand so well on their own. There's an intriguing blend of uncertainty, menace, paranoia, and naked vulnerability that runs through all of the dubs (what's lurking in all the dark, silent space between the music?) --like living under the threat of some looming apocalypse. With titles like "Radiation Ruling the Nation," "Trinity Dub," "Cool Monsoon," and "Backward Sucking" (from the original "Heat Miser"), I envisioned a nuclear attack (of which there is "No Protection" from), radioactive fallout, and utter devastation that there was no coming back from. And it sounds just as brilliant today as it did twenty-two years ago. No Protection is probably one of greatest modern dub records--and it's certainly Mad Professor's masterpiece. Prior to this reissue, the LP version of this album was extremely hard to find, so make sure to pick up a copy now, while you can. This brings me right back to when i discovered it, also at Jammyland! but not in the '90s! Thanks for reviewing one of my favorite records of all time. Wow! Thanks for the interesting background about the album, Victor! Amazing.